After finishing my second Christmas card yesterday I thought it was about time that I updated this blog. So here I am! I’m off today as I booked a holiday to tag onto my 3 day weekend. I have been very productive & no doubt I’ll go back to work tomorrow wishing I’m back at home chilling with Netflix & my cross stitch! First up I’ll share my first finished Christmas card of the year! This project was also my first attempt at stitching with Evenweave. I feel like I’ve gone up in the world. It’s certainly something to try if you feel that you have mastered using Aida. Starting up wasn’t as easy as I thought it would be as I had to get used to counting over strands rather than working with squares. However after a slow start I really got into it. If you need any help starting out then have a look at this link…it set me right. Click Here to read more. The Simple diagram that shows you what to look for when stitching on Evenweave was really helpful. This little sweetie came as a supplement with my magazine subscription with The World of Cross Stitching- Issue 234. I’m really happy with how he turned out & I’m also very proud as I braved the french knots. (The first in a while). Closer to Christmas I will be mounting him onto card to give as a Christmas card. 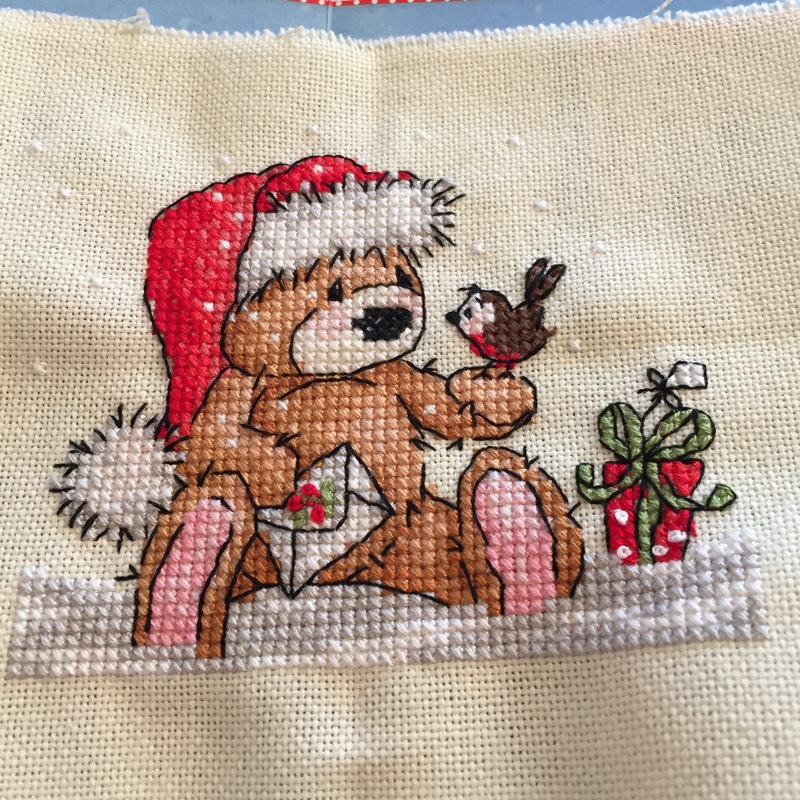 Has anyone else made a start on their Christmas stitching? If so, What have you been up to? Did you know there are only 12 Mondays left until Christmas?? ?